Volvo Ocean Race fleet will arrive in Sanya, China, the third stop on the 2011-12 route around this time next year. The third leg of the 39,270 nm race will be one of the most difficult legs in the upcoming edition. For the first time in the history of the race, the fleet will be sailing from the Middle East to the southern tip of China, following the ancient maritime Silk Route. After rounding the southern tip of India, the Volvo Open 70s will approach the Malacca Strait, leaving the island of Pulau We, Indonesia to starboard. Sailors can expect tight racing from this point on. 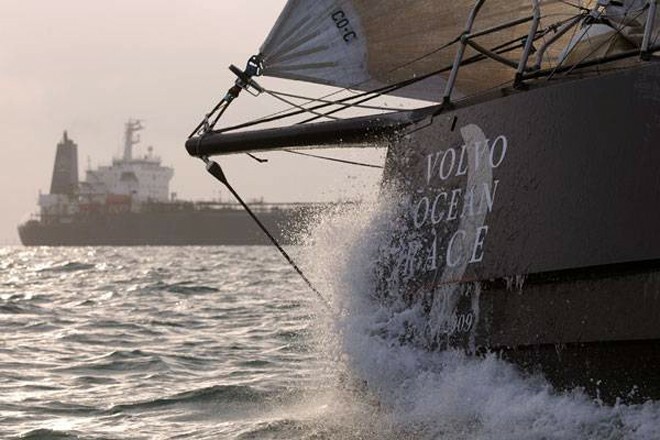 The Malacca Strait is an important shipping lane connecting the Pacific and Indian Ocean and is a very busy zone; the Volvo Open 70s won’t be the only vessels trying to get through and the light winds will force them to stay close to their competitors. The fleet will sail its way out of the strait and into the South China Sea where it will encounter another difficulty: getting through the Spratly Islands, a group of over 750 islands and reefs, many of which are uncharted, making it dangerous to navigate through at high speeds. The biggest difference on the leg is that the fleet won’t be sailing as far north as they did in the previous edition, when the route to Qingdao became one of the coldest and hardest legs of that race for most of the sailors. However, Leg 3 will present its own difficulties and some sailors will recall the challenges from the last race on the leg from Cochin, India to Singapore and the following one to Qingdao, China. To get to Qingdao last time, the fleet sailed east in the South China Sea, passing the Luzon Strait where the boats were caught in the toughest weather conditions of the race, with waves measuring up to 15 metres high. For the first time in the race the boats decided to stop – with the exception of Telefonica Blue, which managed to get across the Strait and finished the leg in first place. Looking for a similar result, Ericsson 3 and Delta Lloyd made the same move, but were not as lucky and suffered serious boat damage. In the 2011-12 edition Leg 3 does not cover the same route, although the fleet will have to encounter this region and its uncertain conditions on the leg to Auckland. Nevertheless, they will still have to watch out for the hundreds of fishing vessels, many without lights or even radars, that will be expecting – or even be aware of – the Volvo Open 70s in the South China Sea. In our first video about Leg 3, ‘The Silk Route’, Jack Lloyd, Race Director in Volvo Ocean Race and Chris Nicholson, skipper for CAMPER discuss the complexity of the new route for this leg. In the second video, ‘Spirit of Asia’, Volvo Ocean Race CEO Knut Frostad analyses the challenges of the third leg from the Malacca Strait to the new destination in China.